Explore the scenic beauty of the Bay on a half-day cruise, including an island visit. During your cruise you’ll make your way through the islands, learning about their history and the wildlife that calls them home. See some of the Bay of Islands’ most scenic highlights on a four-hour cruise around its sheltered waters. 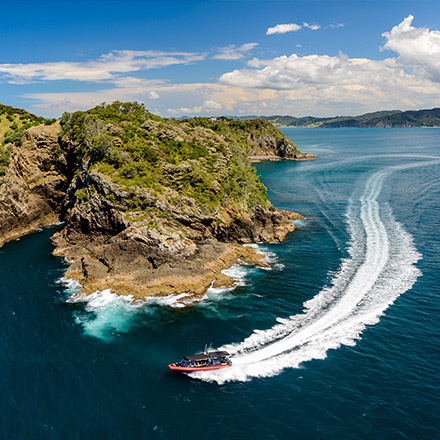 Set off from Paihia or Russell and enjoy the scenic views of secluded islands with their white sand beaches and native forest as you cruise past them. 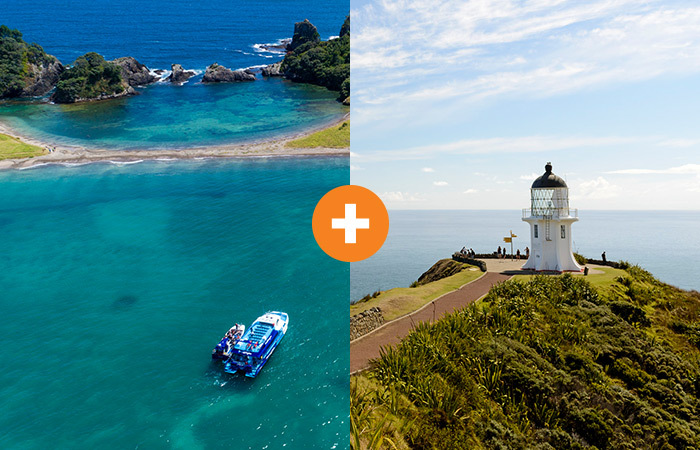 During your cruise you’ll travel out along the Cape Brett Peninsula to the historic lighthouse at its end, and see the famous Hole in the Rock at Motukokako Island. If conditions permit, your skipper will take the boat right through the hole! You’ll also spend some time at Otehei Bay on Urupukapuka Island - relax on the beach, head up to the viewing point for a breathtaking outlook, and grab a snack at the island's cafe. Hat, sunscreen, sunglasses and your camera. A full commentary provided by the skipper. Printed multilingual maps available in Chinese, Japanese and German. You can buy cold drinks and snacks on board, or grab a snack at the cafe on Urupukapuka Island. "The captain was extremely knowledgeable and the crew very helpful especially on the roughest stretch. The Hole in the Rock was amazing as was the island visit. Good trip. Stop off at Russell and catch the ferry back!" "Our captain was great, very informative with a great sense of humour, he gave a good commentary at all the islands we stopped at. The cruise was excellent and going through the Hole in the Rock was an incredible experience." Discover the scenic beauty of the Bay on a half-day cruise and step off the boat for an enjoyable island stopover. Explore an isolated island, soaking in the magnificent views of the Bay. Take an action-packed day tour to the northernmost point in New Zealand and stand at the very top, Cape Reinga. Drive along Ninety Mile Beach, sand surf down massive dunes and walk among giant kauri trees in an ancient forest. Choose our popular Double Dip but swap your dolphin watching cruise for a four-hour Hole in the Rock cruise including an island stopover. Then explore the top of the North Island with a day tour to beautiful Cape Reinga and Ninety Mile Beach. 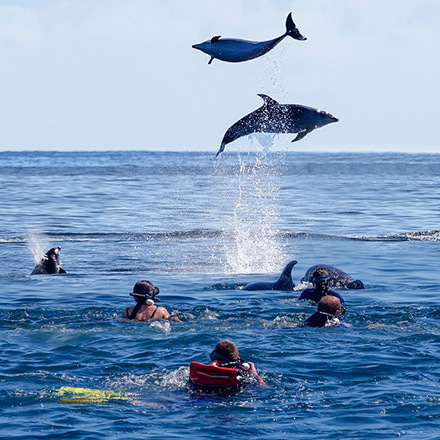 Look for wild dolphins and whales as we cruise out through the islands to Cape Brett and the famous Hole in the Rock. The Bay's most intimate dolphin viewing and swimming experience.